If you're looking for real estate in San Antonio it can be a daunting task. Inevitably as future home buyers narrow their search they will discover some of the better neighborhoods. One of those communities stands out above the pack. Cibolo Canyons is a unique master planned community located in North Central San Antonio. It is a neighborhood with a strategic design and fabulous amenities. Homes For Sale In Cibolo Canyons offer a lifestyle filled with social excitement, numerous resort activities and amenities which are rare to find in other communities. When putting your signature on those closing papers, you are not only signing up for a new home but also preparing for a whole new lifestyle. On paper, you may be the proud owner of a lush yard, 2,500 square feet of air-conditioned paradise and a white picket fence, but you are also a proud resident of a fascinating neighborhood: A network of other families, couples and singles living in an HOA-inspired harmony. Where Is Cibolo Canyons Located? Cibolo Canyons is about 25 miles from San Antonio, a 35-minute drive. It is marked with sophisticated style and tranquil rolling hills. Homes for sale in Cibolo Canyons are diverse, varying by their individual subdivisions with unique characters. The community offers a wide range of superb and custom home builders for home buyers to choose from. Cibolo Canyons features single homes, garden homes, and patio homes built by some of San Antonio’s top-ranking builders. The average price is $152.64 per square foot. Cibolo Canyons suits numerous varying real estate needs with homes ranging from $250,000 Ventanas Subdivision to $1,500,000 for the ultra-luxurious homes. This top neighborhood in San Antonio is strategically located close to both Highway 281, Evans Road and TPC Parkway, which offers residents a quick commute to downtown San Antonio, Loop 1604 and some parts of the city, including places like The Rim, Shops at La Cantera, and San Antonio International Airport, usually just under half an hour. It is conveniently located nearby the Village at Stone Oak, an exciting shopping area popular with retailers, entertainment venues and dining. From the streets layout to the sense of togetherness and the available green space, Cibolo Canyons is unique in its functionality and its design. The numerous amenities in this neighborhood provide a fun round the year to parents, children, retirees and singles alike. 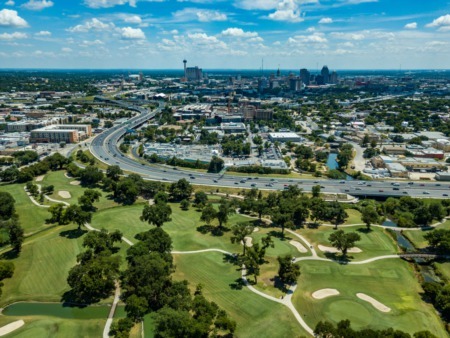 Cibolo Canyons is also home to two PGA TOUR TPC golf courses and JW Marriott San Antonio Hill Country Resort & Spa which provide fabulous PGA Golding, exceptional dining and spas and much more. Other amenities in the community include a junior Olympic-sized swimming pool, fitness centers, marathon and triathlon training grounds, Splash Park, lazy river, a variety of fitness classes and much more. Residents of Cibolo Canyons can enjoy a selection of social programs like holiday parties, swim groups, and preschool playgroups. How Many Homes Are In Cibolo Canyons? This community features 1475 homes across 2,100 acres of picturesque landscape. About 900 acres of this neighborhood are dedicated to open space. This open space gives habitat for wild animals and a safe place to protect the endangered species. It also gives Cibolo Canyons’ residents pristine, breathtaking views. Actually, Cibolo Canyons was honored in 2008 to become the site of the first-ever Green Park homes in San Antonio. Cibolo Canyons is more than just a collection of neighborhoods built together seamlessly around the pillars of luxury living and sustainability. It is a community planned for every stage of life, from growing families, singles, active adults and retirees. It is a neighborhood featuring homes of different tastes, prices, and preferences. Cibolo Canyons also features seven-gated communities: Campanas, Amorosa, Palacios, Cielos, Vallitas, Sueños, and Ventanas. Campanas is a luxurious gated community which offers the finest Garden Home living. The exquisite homes in Campanas gated community are built by Sitterle Homes, an award winning builder. They are conveniently located near the JW Marriot Hill Country Resort, TPC Golf Resort and the medical community in Stone Oak. Campanas luxury garden home community is convenient for retirees looking to downsize and the working professionals. Sitterle Homes takes up the responsibility of maintaining the landscaping so that residents can focus on what is important to them. What School Districts Is Cibolo Canyons In? Two school districts serve Cibolo Canyons: Judson Independent School District and North East Independent School District. The Amorosa, Campanas, and Palacios are within the boundaries of Judson ISD, while North East ISD serves Sueños, Ventanas, and Vallitas. North East Independent School District is a ‘Recognized’ district. 35.2% of schools in North East ISD have an ‘Exemplary’ rating, 42.3% ‘Recognized’ rating, 12.75 are rated ‘Academically Acceptable’ while 9.9% are not rated. Judson is a smaller school district with 28 schools. It is also a ‘Recognized’ district school with 39.3% of its schools ‘Recognized,’ 25% ‘Exemplary,’ 25% ‘Academically Acceptable’ and 10.7% of them are not rated. Cibolo Canyons resort community is remarkable. With over 900 acres dedicated to wild animals, breathtaking landscape, fabulous community amenities, and distinctive homes, Cibolo Canyons is conveniently planned for every stage of life. Cresta Bella is another great neighborhood near Cibolo Canyons with similar listings is Cresta Bella that could suit your needs.